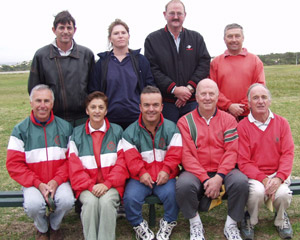 On Saturday 21st June 2003, West Atholl Rifle Club, representing Perth Scotland, fired a postal match against Perth Australia. Members were faced with theoretically easy conditions comprising minimal wind, a dull light and cool conditions at 13C. However the usually scenic Jubilee range was not at its most pleasant with the persistent light rain turning misty at times and making shooting more difficult. The most unpleasant aspect of the day was that every midge in Perthshire seemed to have congregated on the range - mostly at the 600 yard firing point and in the target pit. The most worthy score was made by Mike Barton shooting in the standard Target Rifle class who almost matched the scores from the unrestricted F class. 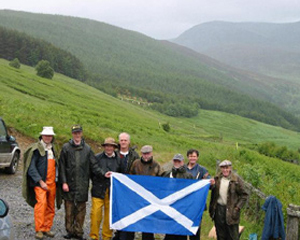 Another noteworthy score was that made by Alastair Munro at the age of 86. Perth Australia, shooting 10 hours earlier, have reported their score as 854v43 thus giving them a fairly easy victory. This included a perfect 100 from their President Chris Hope. Hopefully Perth Scotland will close the gap in future years. The match was first fired in 1970 when the respective Mayors of the two cities donated shields which are now held by the opposite clubs. Due to the vagaries of postal communication the match lapsed through the 1990s but with the help of the internet it is hoped to shoot it every year. Presented by E.H Lee Steere C.B.E. Team from uphill is Richard Scott, Des Parr, Jim Bell, Gerry Hogston, Alastair Munro, Mike Barton, Kenny McDonald and Eddy Jones. 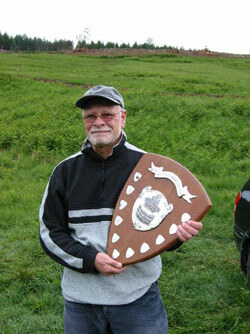 Mike Barton Top Scorer TR holding shield. Well done Perth Australia - you have beaten us fairly convincingly in both classes. Your F class in particular was well ahead of ours. A press release will made to our Perthshire Advertiser.